An out-of-control car hit a pizza deliveryman walking down the street before smashing into a building in Jersey City, police and witnesses say. It's not clear what caused the driver to plow into the building at Martin Luther King Drive and Armstrong Avenue. 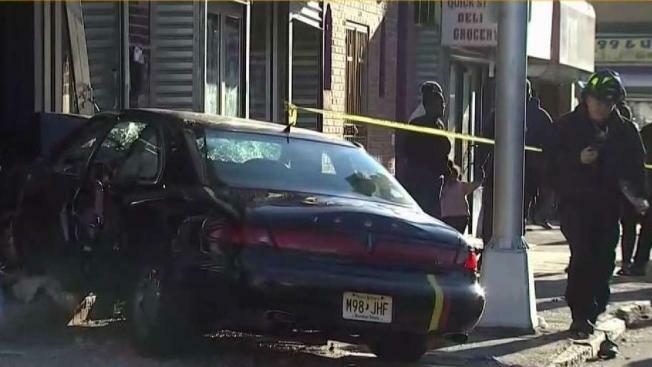 News 4 cameras at the scene showed the the hood of the black sedan crumpled and the windshield smashed, stuck in the front of the smashed-in photography business. Surveillance video obtained by News 4 shows the car flying down the street just before the crash. A doctor working on the block he ran out to help when the car hit a pizza deliveryman, who happened to be on his way to the doctor's office. "All of a sudden I hear a lot of screaming and you hear a big bang," the doctor told News 4. "So I ran out to see what's going on, the gentleman's on the ground next to the car." The doctor helped stabilize the deliveryman, who was "screaming and in a lot of pain." He's been taken to a local hospital. The driver of the crumpled sedan had to be extricated by emergency responders using the Jaws of Life. His condition was unknown. Only the owner was in the photography shop at the time, and he said he was not hurt.